MIAMI - Jan. 16, 2014 - PRLog -- Hiromi Asai, a kimono fashion stylist and an owner of Kimono Hiro in FL / Mode & Classic, presents the Kimono Lecture and Demonstration on January 21, 2014 at 10:00 AM at Fairchild Tropical Botanic Garden, Coral Gables for International Ikebana Miami Chapter 131 monthly meeting. The tile of this presentation is "Kimono and Obi". Kimono is a traditional Japanese dress, but in this presentation, Hiromi Asai talks about various aspects of kimono: history, art, and fashion and discuss about the future of the kimono as one of the casual and formal fashion items in the world. In the latter part of this presentation, Hiromi Asai demonstrates how to dress a woman and man in the authentic kimono style. In addition to the members of International Ikebana Miami Chapter 131, guests may attend this event, but RSVP is necessary For information and to register, please call 305-667-4573. Hiromi Asai (http://www.kimonoflorida.com/portfolio.html) is a New York-based kimono stylist and designer. She, born in Tokyo, grew up surrounded by traditional Japanese culture. In University, she studied traditional Japanese theater and its fashion, which gave her a deeper appreciation for the history of the kimono. Furthermore, she studied tea ceremony, classical Japanese dance and Noh. To acquire more skills and knowledge about the kimono, she learned kimono styling and traditional Japanese dressmaking at the kimono fashion academy. She became a certified master kimono instructor and started working as a professional kimono stylist. After she came to New York City in 2008, she started her styling business as Kimono Hiro in NY. Then she founded MODE & CLASSIC LLC in 2010. MODE & CLASSIC is now recognized as a unique kimono styling / design company in the United States. Her activity attracts attention in the United States, as the interview appeared in The New York Times ("Wrestling the silk" in April, 2009) and the opinion about kimono fashion was published in The International Herald Tribune / New York Times ("Liberate the kimono" in March, 2011). Hiromi Asai and Mode & Classic created various fashion & art pieces featuring kimono for advertisements (Verizon Wireless in 2009), fashion magazines, films and TV programs. Hiromi Asai and Mode & Classic also gave kimono demonstrations across the States. Hiromi Asai collaborated with a designer, Susan Cianciolo to produce fantastic styles at New York Fashion Week Autumn/Winter 2011collection. The collaboration in the art field was accomplished with a visual artist and photographer, Laurie Simmons, to create a film: Geisha Song (February, 2011) and a series of photos: The Love Doll (August and October, 2011). In addition, Hiromi Asai and Mode & Classic successfully produced a series of kimono fashion shows at Van Gogh Museum in Amsterdam and The Museum of World Culture in Gothenburg, Sweden in April, 2011. Mode & Classic is expanding the world-wide business for kimono fashion design and styling. Furthermore, Hiromi Asai and MODE & CLASSIC present bi-annual seasonal fashion collection featuring kimonos, starting as "FUSION" for Spring/Summer 2012 at BK Fashion Weekend. 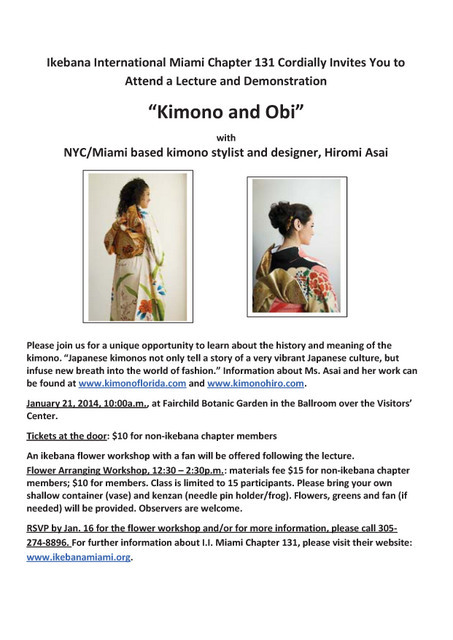 In 2013, Hiromi Asai opens a new studio "Kimono Hiro in FL" in Downtown Miami, Florida. We will offer various services related to kimono and Japanese fashion in New York as well as in Florida. Kimono Hiro in FL now accepts many students to learn how to put on kimono at our New Studio in Miami.